For the contemporary Duke of Schleswig, see Valdemar IV, Duke of Schleswig. Valdemar IV Atterdag (the epithet meaning "A New Dawn"), or Waldemar (1320 – 24 October 1375; Danish: Valdemar Atterdag), was King of Denmark from 1340 to 1375. He was the youngest son of King Christopher II of Denmark and Euphemia of Pomerania. He spent most of his childhood and youth in exile at the court of Louis IV, Holy Roman Emperor in Bavaria, after the defeats of his father and the death and imprisonment, respectively, of his two older brothers, Eric and Otto, at the hand of the Holsteiners. Here he acted as a pretender, waiting for a comeback. Following the assassination of Gerhard III, Count of Holstein-Rendsburg, by Niels Ebbesen and his brothers, Valdemar was proclaimed King of Denmark at the Viborg Assembly (landsting) on St John's Day (St Hans' Day) on 24 June 1340, led by Ebbesen. By his marriage with Helvig of Schleswig, the daughter of Eric II, Duke of Schleswig, and with what was left to him by his father, he controlled about one quarter of the territory of Jutland north of the Kongeå river. He was not compelled to sign a charter as his father had done, probably because Denmark had been without a king for years, and no one expected the twenty-year-old king to be any more trouble to the great nobles than his father had been. But Valdemar was a clever and determined man and realized that the only way to rule Denmark was to get control of its territory. Ebbesen attempted to liberate central Jutland from the Holsteiners at the siege of Sønderborg Castle on 2 November 1340, but Ebbesen and his brothers were killed. Around 1346 Valdemar IV initiated a crusade against Lithuania. Franciscan chronicler Detmar von Lübeck noted that Valdemar IV traveled to Lübeck in 1346, then turned to Prussia together with Erich II of Saxony in order to fight the Lithuanians. However, the crusade against the Lithuanians came to nothing, instead Valdemar went on a pilgrimage to Jerusalem (without Papal permission). He succeeded and was made a Knight of the Holy Sepulchre in honor of his accomplishment. He was censured by Pope Clement VI for not getting prior approval for such a journey. Upon his return, Valdemar gathered an army. In 1346, he took back Vordingborg Castle, the main headquarters of the Holsteiners. By the end of the year, Valdemar could claim all of Zealand as his own. He made Vordingborg his personal residence, expanded the castle, and built the Goose Tower which has become the symbol of the town. Valdemar's reputation for ruthlessness against those who opposed him made many think carefully about switching sides. His tax policy crushed the peasants who feared to do anything but pay up. By 1347 Valdemar had thrown out the Germans and once again Denmark was a nation. With his increased income, Valdemar was able to pay for a larger army and by treachery came into possession of Nyborg Castle and eastern Funen Island and the smaller islands. Valdemar's attention had just turned to Skåne, held by Sweden,when disaster struck the entire region. In 1349 Bubonic Plague (then known as the "Black Death") arrived unexpectedly. Tradition has it that plague came to Denmark on a ghost ship that beached itself on the coast of northern Jutland. Those who went aboard found the dead swollen and black faced, but stayed long enough to take everything of value from it and thereby introduced the fleas that carried the disease into the population. People began to die by the thousands. During the next two years plague swept through Denmark like a forest fire. In Ribe twelve parishes ceased to exist in a single diocese. A few towns simply died with no one left alive. The general figures for plague in 1349–50 ranges between 33% and 66% of the people of Denmark. City dwellers were often harder hit than farm folk leading many people to abandon towns altogether. Valdemar remained untouched and took advantage of the deaths of his enemies to add to his growing lands and properties. He refused to reduce the taxes the following year though fewer peasants farmed less land. 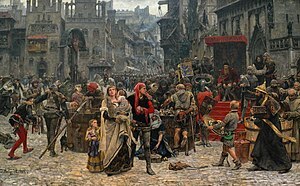 Nobles, too, felt their incomes shrink and the tax burdens fell heavier on them as well. Uprisings flared up in the following years. Valdemar responded by raising an army and march through southern Jutland taking still more pieces of the lands that German counts had pried away from Denmark in the previous years. Rebellion spread quickly through Funen and he ravaged the Holsteiners' remaining territories and took the rest of the island. The charter proved to be useless when the king ignored the terms and the sporadic rebellions continued. That same year there was a monetary crisis which caused panic all over northern Europe. There is a famous poem, written by Jens Peter Jacobsen and included in his work Gurresange about Valdemar's mistress, Tove, who was killed on the orders of Queen Helvig, though that particular story saga originally seems to be connected with his ancestor Valdemar I of Denmark. Valdemar could do little about the increasing power of the Hanseatic League which had already become a major power in the region. Even before the conclusion of the small conflict with King Magnus, Valdemar decided to attack the Swedish island of Gotland, specifically the town of Visby.He raised an army loaded on ships and invaded Gotland in 1361. Valdemar fought the Gotlanders and defeated them in front of the city, killing 1800 men. The city surrendered, and Valdemar tore down part of the wall to make his entry. Once in possession, he set up three huge beer barrels and informed the city fathers that if the barrels weren't filled with silver and gold within three days, he would turn his men loose to pillage the town. To Valdemar's surprise the barrels were filled before nightfall of the first day passed. The churches were stripped of their valuables and the riches were loaded on Danish ships and carried home to Vordingborg, Valdemar's residence. 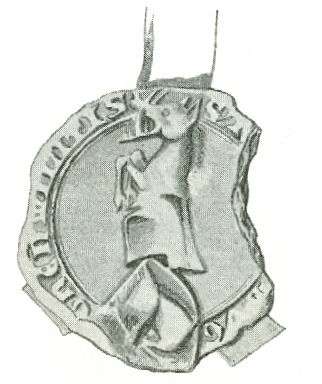 Valdemar added "King of Gotland" to his title list. But his action against Visby, a member of the Hanseatic League, would have dire consequences later. Valdemar tried to interfere with the succession in Sweden by capturing Countess Elizabeth who was to marry Crown Prince Håkon of Sweden. She was forced into a nunnery and Valdemar convinced King Magnus that his son should marry Valdemar's daughter, Margrethe. The king agreed, but the nobles did not and forced Magnus to abdicate. They elected Albrecht of Mecklenburg, one of Valdemar's sworn enemies, as King of Sweden. Albrecht immediately went to work to stop Valdemar in his tracks. He persuaded the Hansa states to work with him because Valdemar threatened their access through the Sound and to the lucrative herring trade. Valdemar attacked the Hansa fleet trying force them out of the Sound fishing grounds. The Hansa member states demanded action. With Lübeck in the lead, they wrote to Valdemar complaining about his interference with trade. In 1362 the Hansa states, Sweden, and Norway allied against Valdemar seeking retribution. The Hansa sent a fleet and an army to ravage the coasts of Denmark, and they succeeded in capturing and pillaging Copenhagen and parts of Skåne. Combined with the rebellious nobles in Jutland, they forced Valdemar out of Denmark at Easter in 1368. King Valdemar was a pivotal figure in Danish history; he gradually reacquired the lost territories that had been added to Denmark over the centuries. His heavy-handed methods, endless taxation, and usurpation of rights long held by noble families led to uprisings throughout Valdemar's reign. His attempt to recreate Denmark as a power in northern Europe was welcomed by the Danes in the beginning, but Valdemar's policies met with bitter opposition by the great landed families of Jutland. He expanded the powers of the king based upon his military prowess and the loyal nobility that became the foundation of Danish rulers until 1440. Many foreigners were appointed as court officials and councillors. The most important of them was the German-Slavic nobleman Henning Podebusk who was drost (prime minister) from 1365 to 1388. Valdemar IV is often regarded as one of the most important of all Danish medieval kings. The sources give the impression of an intelligent, cynical, reckless and clever ruler with a talent for both policies and economy. His grandson Albert by his eldest daughter Ingeborg was offered unsuccessfully by his grandfather Albert II, Duke of Mecklenburg as Valdemar's successor. Instead his grandson Olaf II, the offspring of his daughter Margaret and Haakon VI of Norway, son of Magnus II of Sweden, was elected as his successor. His nickname "Atterdag" is usually interpreted as "day again" (its literal meaning in Danish), indicating that he brought new hope to the realm after a dark period of bad kingship. The epithet has also been suggested as a misinterpretation of the Middle Low German phrase "ter tage" ("these days"), which can best be interpreted as "what times we live in!" In his biography of Valdemar, Fletcher Pratt stated it meant "another day", that is, whatever happened today, good or bad, tomorrow would be another day. Many stories, ballads, and poems have been made about Valdemar. He was "reinvented' as one of the Danish hero kings during the mid-19th century when Denmark was fighting Germany for its traditional southern Jutland region. Margaret of Denmark (1345–1350), betrothed to Henry III, Duke of Mecklenburg, died young. Ingeborg of Denmark (1347–1370), married Henry III, Duke of Mecklenburg, and was the maternal grandmother of King Eric VII of Denmark. Catherine of Denmark (1349), died young. Valdemar of Denmark (1350 – 11 June 1363), died young. Margaret I of Denmark (1353–1412), married King Haakon VI of Norway, and was Queen of Denmark, Norway, and Sweden. Evidence indicated also an illegitimate son, Erik Sjællandsfar, at Orebygård on Zealand, buried in Roskilde Cathedral with a crown. However, other evidence indicate that he was a son of King Eric VI of Denmark. ^ "Valdemar Atterdag –1375". Dansk biografisk Lexikon. Retrieved August 1, 2018. ^ a b "Valdemar Atterdag og genopbygning af kongemagten 1340-75". danmarkshistorie (Aarhus University). Retrieved August 1, 2018. ^ "Danehof". danmarkshistorie (Aarhus University). Retrieved August 1, 2018. ^ Tunbridge, Laura (2010). The Song Cycle. Cambridge University Press. p. 113. ^ "Leo Hussain, eroul serii la Gurre-Lieder". Adevărul. 9 September 2013. Retrieved 26 November 2014. ^ "Niels Bugge, approx. 1300-1358". danmarkshistorien.dk. Retrieved August 1, 2018. ^ "Magnus Eriksson". Svenskt biografiskt lexikon. Retrieved August 1, 2018. ^ "Erik Magnusson". Svenskt biografiskt lexikon. Retrieved August 1, 2018. ^ "Chronology of Sweden". worldtimeline.info. Retrieved August 1, 2018. ^ "Podebusk, Erik –1573". Dansk biografisk Lexikon. Retrieved August 1, 2018. ^ "A Medieval battle in Visby, Gotland". visbysweden.com. Retrieved August 1, 2018. ^ "Valdemar Atterdag, ca. 1321-1375". danmarkshistorien.dk. Retrieved August 1, 2018. ^ "Erik Sjællandsfar Prins af Danmark". toveogflemming.dk. Retrieved August 1, 2018. Wikisource has the text of the 1911 Encyclopædia Britannica article Valdemar IV..